So, if you have read The Rules, as I am sure you all have, you will recal that under Rule II.1.2 states, Foreign songs, especially Latin songs shall not be counted. You may also recall that Rule II.1.2.1 states that this rule is a tad tricky. With that having been said, why include this song, which is of Latin origin? It turns out that it is not totally of Latin origin. According to the Wikipedia page for this song, this song's title is taken from the Japanese film of the same name, which bears the title In the Realm of the Senses in America. The literal translation of Ai no corrida (愛のコリーダ in Japanese) is "bullfight of love." With corrida being brought over from Spanish and the last four chacaters of the Japanese title of the film (コリーダ) being a transliteration of the Spanish corrida. Confused? Good! I know what you're saying now. Bullfights and bullfighting are at least passingly Spanish. And a Spanish word is in the title! What gives? Why include it? Well, the original song written by Chas Jankel and Kenny Young has English lyrics, as do the various cover versions of the song. This particular cover is of Quincy Jones' version sung by Vania Borges with the lyrics in Spanish as translated by Victor Reina. 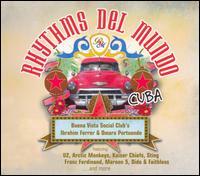 As you can see from above, this track comes from the benefit album, Rhythms del Mundo: Cuba. The album gets my highest recommendation! Don't forget to check out the other tracks from the Rhythms del Mundo: Cuba: Arctic Monkeys, Vania Borges (covering Norah Jones! ), Coldplay, Dido & Faithless, Coco Freeman featuring Franz Ferdinand, Coco Freeman featuring U2, Maroon 5, Omara Portuondo, and Aquila Rose & Idana Valdes. Special thanks Denshi Jisho - Online Japanese dictionary for translating assistance and thanks to Pīnyīn.info for their kanji to unicode conversion tool.